Difference between revisions of "9"
[[File:Posterplaceholder.png|right]]'''#9''' aka '''Untitled #9''' aka '''No. 9''' is the alias by which [[Quentin Tarantino]]'s upcoming and ninth motion picture is currently being referred to in Hollywood. Title and story are currently unknown, what is known is that the film is set in Los Angeles in the late ’60s and early ’70s. Tarantino has repeatedly stated that the movie is not about Charles Manson, but one of his victims, Sharon Tate, seems to be a main character in the story. "Those who’ve read it said the script has heart and a strong commercial appeal, and if there is a film of Tarantino’s it can be best compared to, it would be Pulp Fiction, which also was set in Los Angeles. The film will carry a budget in the range of Django Unchained." (Deadline). [https://www.vanityfair.com/hollywood/2017/11/quentin-tarantino-harvey-weinstein-sony-manson-movie According to Variety], the plot involves a male TV actor and his stunt double sidekick looking for a way into the movie biz after one hit series. The murder of Sharon Tate and her friends by the hands of Charles Manson's murderous family is the backdrop to the main story. [[File:Posterplaceholder.png|right]]'''#9''' aka '''Untitled #9''' aka '''No. 9''' is the alias by which [[Quentin Tarantino]]'s upcoming and ninth motion picture is currently being referred to in Hollywood. Title and story are currently unknown, what is known is that the film is set in Los Angeles in the late ’60s and early ’70s. Production will begin mid-2018 for a 2019 release, aiming for an R-rating. The budget is said to be approx $100 million. The deal with Sony Pictures is said to include first-dollar gross and final cut on the film for Quentin. Tarantino has repeatedly stated that the movie is not about ''Charles Manson'', but one of his victims, ''Sharon Tate'', seems to be a main character in the story. "Those who’ve read it said the script has heart and a strong commercial appeal, and if there is a film of Tarantino’s it can be best compared to, it would be [[Pulp Fiction]], which also was set in Los Angeles. The film will carry a budget in the range of [[Django Unchained]]." (Deadline). [https://www.vanityfair.com/hollywood/2017/11/quentin-tarantino-harvey-weinstein-sony-manson-movie According to Variety], the plot involves a male TV actor and his stunt double sidekick looking for a way into the movie biz after one hit series. The murder of Sharon Tate and her friends by the hands of Charles Manson's murderous family is the backdrop to the main story. It will be produced at and distributed with Sony Pictures (worldwide). Producers are David Heyman, [[Shannon McIntosh]] and Quentin Tarantino. Executive and line producer: Georgia Kacandes. Quentin's [[L. Driver Productions]], Inc. and Heyday Films, Mr Heyman's shop., are so far listed as production companies. Production will begin mid-2018 for an [http://variety.com/2017/film/news/quentin-tarantino-manson-film-1202628252/ August 9, 2019 release], aiming for an R-rating. The budget is said to be approx $100 million. The deal with Sony Pictures is said to include first-dollar gross and final cut on the film for Quentin. It will be produced at and distributed with Sony Pictures (worldwide). Producers are [[David Heyman]], [[Shannon McIntosh]] and [[Quentin Tarantino]]. Executive and line producer: Georgia Kacandes. Quentin's [[L. Driver Productions]], Inc. and Heyday Films, Mr Heyman's shop, are so far listed as production companies. Actors and actresses rumored to be in talks for roles are Margot Robbie (as Sharon Tate); Tom Cruise, Brad Pitt and Leonardo DiCaprio (for two possible male leads). #9 aka Untitled #9 aka No. 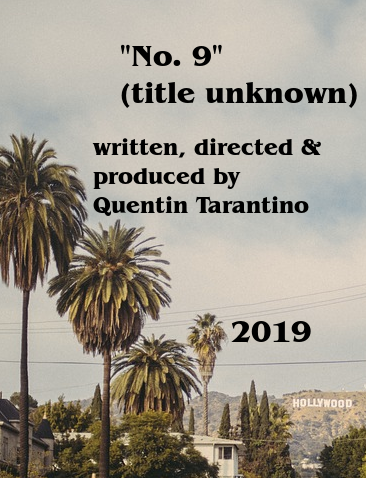 9 is the alias by which Quentin Tarantino's upcoming and ninth motion picture is currently being referred to in Hollywood. Title and story are currently unknown, what is known is that the film is set in Los Angeles in the late ’60s and early ’70s. Tarantino has repeatedly stated that the movie is not about Charles Manson, but one of his victims, Sharon Tate, seems to be a main character in the story. "Those who’ve read it said the script has heart and a strong commercial appeal, and if there is a film of Tarantino’s it can be best compared to, it would be Pulp Fiction, which also was set in Los Angeles. The film will carry a budget in the range of Django Unchained." (Deadline). According to Variety, the plot involves a male TV actor and his stunt double sidekick looking for a way into the movie biz after one hit series. The murder of Sharon Tate and her friends by the hands of Charles Manson's murderous family is the backdrop to the main story. Production will begin mid-2018 for an August 9, 2019 release, aiming for an R-rating. The budget is said to be approx $100 million. The deal with Sony Pictures is said to include first-dollar gross and final cut on the film for Quentin.